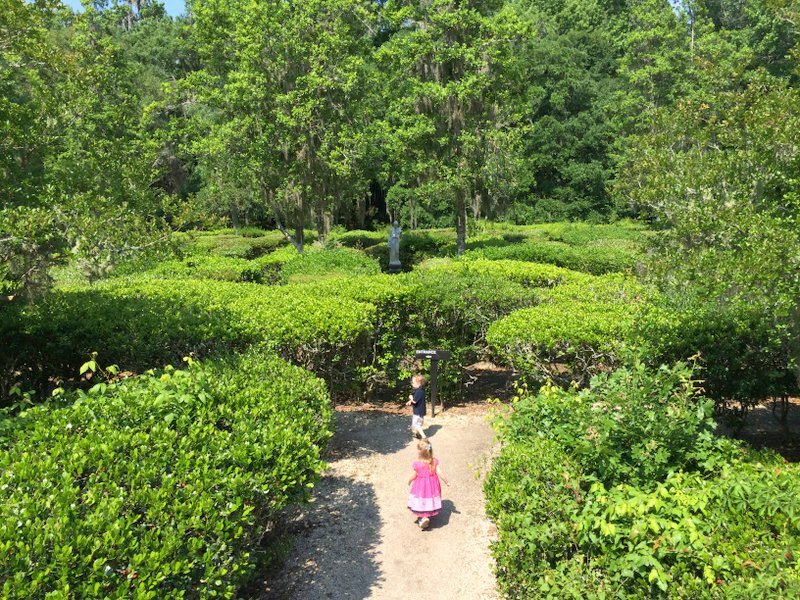 This post is part of a series about things to do with kids in Charleston, SC. Check out the full list. Magnolia Plantation & Gardens is a former rice plantation on the Ashley River just a few minutes drive from downtown Charleston. The main draw at Magnolia are acres of gardens of all kinds, one rolling into the next in an informal style. We are big fans of botanical garden type attractions at most places we visit, so this was right up our alley. The gardens are accessed mainly on foot, via a network of pathways that wind between ponds, swamps, and rivers. Most of the area doesn’t actually feel much like a “garden”, but more like a particularly beautiful piece of forest or field. Note: The paths are a little rough for regular strollers but the large-wheeled jogging types would be fine on most of them. During our visit many fields were lush with wildflowers of all colors. There were also several open spaces for the kids to run around in and a variety of animals to spot including birds and little lizards. 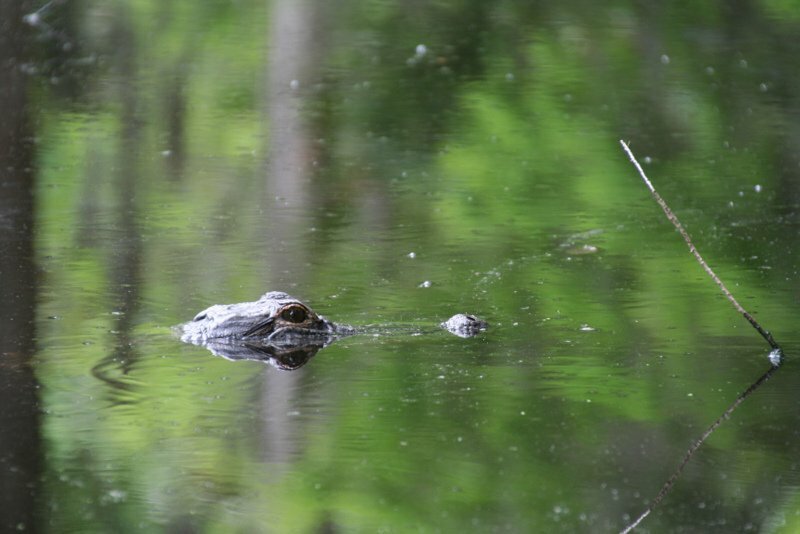 We even came across an alligator lounging near the edge of one of the ponds – keep the little ones close! There’s a tall observation tower that you can walk to and climb for panoramic views of the former rice fields. It’s a decent hike from the main house area – probably 15-20 minutes one-way – but the scenery is beautiful all the way there and back so if you can manage it physically it’s worth the effort. Near the main house there’s a hedge maze that was just about the right difficulty and length for our 3-yr olds. It took the four of us a few minutes to get on the same page (apparently everyone but me knows you are supposed to find the center of the maze, so you can image Kate’s surprise when I triumphantly led us all back to the entrance). But once we all had the same goal we found the statue at the center without too many wrong turns or dead ends. The highlight of the visit for the kids was the petting zoo, which is certainly one of the best we’ve been to anywhere as rated on the “how hard was it to get the kids to leave” scale. After passing through a double gate in the fence you enter a farmyard with a somewhat bizarre mix of deer, goats, peacocks, chickens, ducks, geese, and squirrels roaming freely around you. All the free-range petting zoo animals seemed friendly enough (even the deer who was determined to eat my backpack) and didn’t mind the kids petting them, chasing them, and talking (or yelling!) to them. 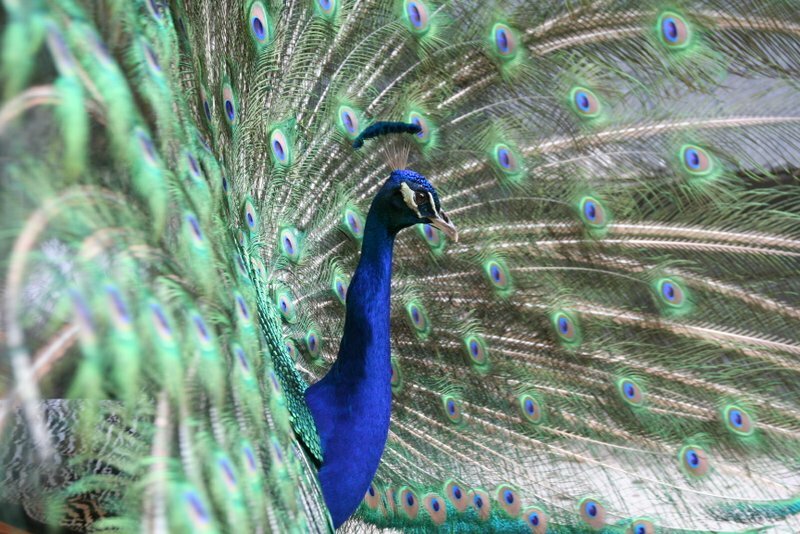 There were also several other animals in cages around the perimeter and scattered elsewhere within the petting zoo area, including bobcats, owls, and hawks. Exploring Magnolia Plantation was a perfect way to spend a half day outside enjoying the warm spring weather in Charleston. 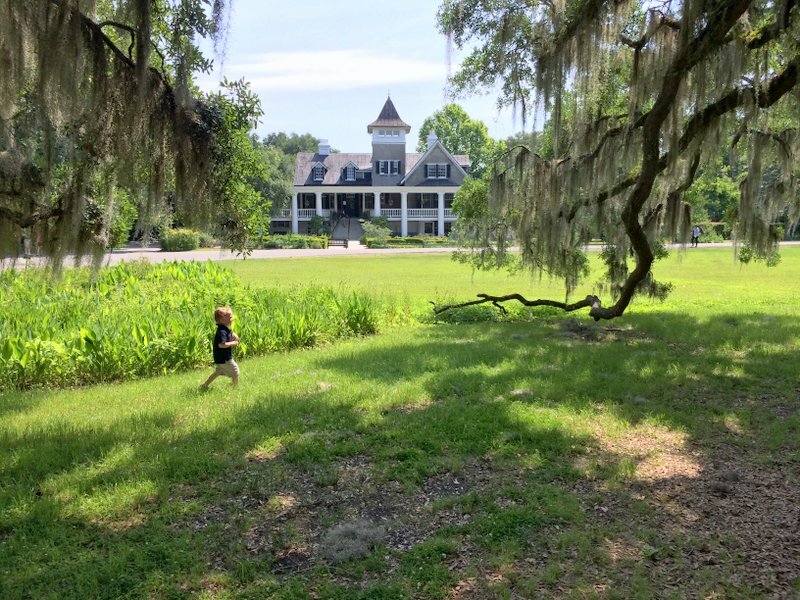 There are several additional attractions on the grounds that we didn’t get to see, including tours of the plantation house, boat and tram tours, and an Audubon Swamp Garden. We’ll have to come back! 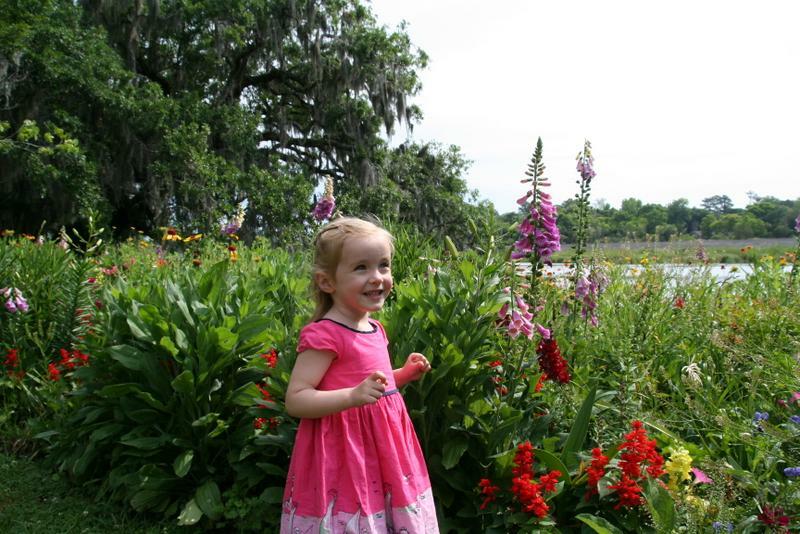 Check out our full list of things to do with kids in Charleston, SC. Hours: Open 365 days a year. 8am – 5:30pm in summer (10 Mar-Oct) and 9am – 4:30 pm in winter (Nov-Feb). Details here. Cost: General admission $15 for adults and $10 for kids 6-12; kids under 6 are free. See their website for details on extra cost for additional activities. Admission is good for re-entry within 7 days. Time: We spent the better part of a morning walking around the gardens and seeing animals in the petting zoo. We grabbed a quick lunch at the on-site cafe before heading out. Even with this half-day we still missed the plantation house itself, the boat and tram tours, and the Audubon Swamp Garden. If we had been in town longer, we probably would have taken advantage of the re-entry policy to return and see some of the parts we missed. Getting There: Check out the map below or find directions on the plantation website from a variety of starting points.